For other uses, see Fauna (disambiguation). Fauna is all of the animal life present in a particular region or time. The corresponding term for plants is flora. Flora, fauna and other forms of life such as fungi are collectively referred to as biota. 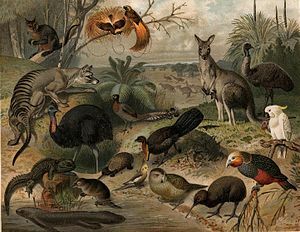 Zoologists and paleontologists use fauna to refer to a typical collection of animals found in a specific time or place, e.g. the "Sonoran Desert fauna" or the "Burgess Shale fauna". Paleontologists sometimes refer to a sequence of faunal stages, which is a series of rocks all containing similar fossils. The study of animals of a particular region is called faunistics. Fauna comes from the name Fauna, a Roman goddess of earth and fertility, the Roman god Faunus, and the related forest spirits called Fauns. All three words are cognates of the name of the Greek god Pan, and panis is the Greek equivalent of fauna. Fauna is also the word for a book that catalogues the animals in such a manner. The term was first used by Carl Linnaeus from Sweden in the title of his 1745 work Fauna Suecica. Australian and New Zealand fauna. This image was likely first published in the first edition (1876–1899) of the Nordisk familjebok. Cryofauna refers to the animals that live in, or very close to, cold areas. 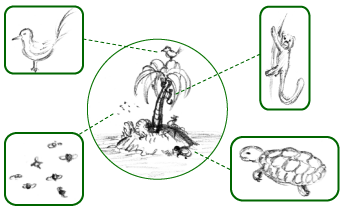 Cryptofauna are the fauna that exist in protected or concealed microhabitats. Infauna are benthic organisms that live within the bottom substratum of a water body, especially within the bottom-most oceanic sediments, rather than on its surface. Bacteria and microalgae may also live in the interstices of bottom sediments. In general, infaunal animals become progressively smaller and less abundant with increasing water depth and distance from shore, whereas bacteria show more constancy in abundance, tending toward one million cells per milliliter of interstitial seawater. Epifauna, also called epibenthos, are aquatic animals that live on the bottom substratum as opposed to within it, that is, the benthic fauna that live on top of the sediment surface at the seafloor. Macrofauna are benthic or soil organisms which are retained on a 0.5 mm sieve. Studies in the deep sea define macrofauna as animals retained on a 0.3 mm sieve to account for the small size of many of the taxa. Megafauna are large animals of any particular region or time. For example, Australian megafauna. Meiofauna are small benthic invertebrates that live in both marine and freshwater environments. The term meiofauna loosely defines a group of organisms by their size, larger than microfauna but smaller than macrofauna, rather than a taxonomic grouping. One environment for meiofauna is between grains of damp sand (see Mystacocarida). In practice these are metazoan animals that can pass unharmed through a 0.5 – 1 mm mesh but will be retained by a 30–45 μm mesh, but the exact dimensions will vary from researcher to researcher. Whether an organism passes through a 1 mm mesh also depends upon whether it is alive or dead at the time of sorting. Mesofauna are macroscopic soil animals such as arthropods or nematodes. Mesofauna are extremely diverse; considering just the springtails (Collembola), as of 1998, approximately 6,500 species had been identified. Microfauna are microscopic or very small animals (usually including protozoans and very small animals such as rotifers). Other terms include avifauna, which means "bird fauna" and piscifauna (or ichthyofauna), which means "fish fauna". ^ Josef Rusek (1998). "Biodiversity of Collembola and their functional role in the ecosystem". Biodiversity and Conservation. 7 (9): 1207–1219. doi:10.1023/A:1008887817883. Look up fauna in Wiktionary, the free dictionary. Wikimedia Commons has media related to Fauna. "Biodiversity of Collembola and their functional role in the ecosystem"